A dry fly which does well for trout. 2) Tie in the chuck, this should be longer than the hook the hook. 3) Tie in the wing leaving enough room for the head (about 1/4 from eye) using figure of 8 wraps. 4)Pull the wings upright and secure in this position using a few wraps of thread around the base. 6) Wrap the dubbing forward forming a tapered body. 7) Tie in the hackle just behind the wing with the tip toward the back of the fly. 8) Dub the hoohshank right up to the eye forming the thorax and head. 9) Now wrap the hackle forward, two turns behing the wing and two turns in front, Tie off and whip finish. 10) Pull the wing upward and trim just above he hackle tips. 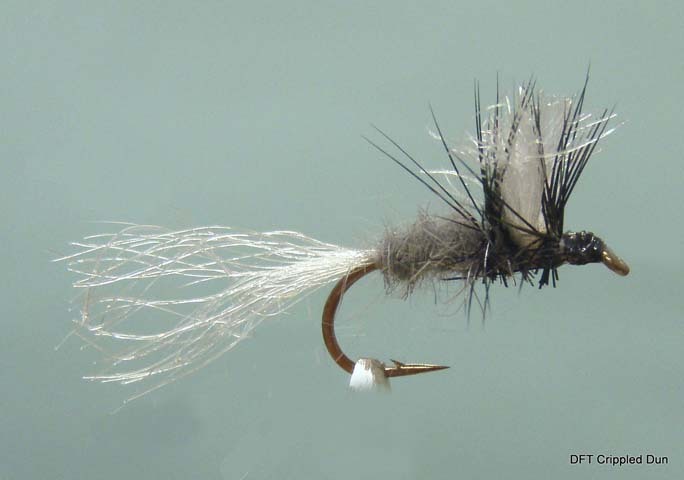 11) Turn the fly and trim the hackle directly below the body forming an inverted V when viewed from the front.